Last summer I found out that I was going to be a grandmother. This was a mixed blessing I was happy but I thought that my daughter should have waited till she was older to start a family. Grandma under 50, I’m still raising my boys who are now 11 a and 13. It did not take me long to get over that confusion one look at the baby I was sold. 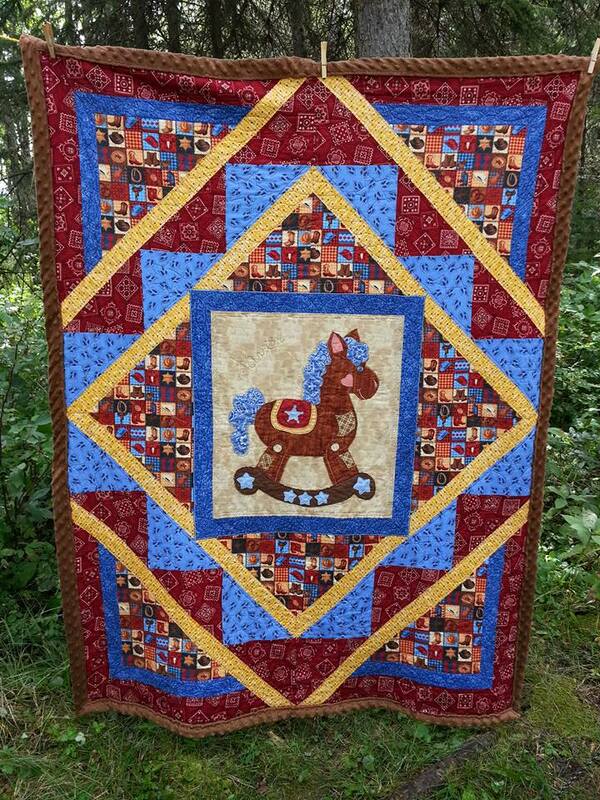 So here I was going to be a grandma… being a quilter I knew that my girl would be expecting a quilt for the baby. This had to be a spectacular quilt so to the drawing board I went. I knew that it would have a western theme as I am a real cow girl at heart and the baby would probably be on a horse before he/she turned a year old. So I knew how much this quilt would get used as my girl is still using hers at 21 years of age… her blankly makes Linus from Charley browns look new. I wanted the child to be able to grow into the quilt. so I made it larger. Near the end of January I was blessed with a grandson Xavier. He got his quilt and has been using it on a regular basis. it gets tossed on the lawn for outdoor time, on the floor wherever he is for floor time. and so on. I did up a pattern for this quilt using my EQ7 Program. I love that I was able to scan my fabrics right into the program and use them. I had already done some applique designs so doing the Rocking horse was not such a task. Unfortunately, I found it quite a challenge to be able to get 45 degree angles. After 8 months of tweaking I finally got it and I now have full written directions for this pattern. I call it Buckaroo Steed. This one was made by one of my testers Evelyn Smith and Marylou Hilderbrandt. I think she did a wonderful job with my pattern.